A Perfect Romantic Getaway in one of the countries most magical cities!! The 1869 original Carriage House is a free standing cottage behind the main house with its own private entrance off the lane. It is located on the 2nd floor over the garage like all original carriage houses in Savannah. The carriage house is where the driver lived in the 1800s above the horses and carriages he cared for. The Wedding Cake Carriage House comes with a highly coveted garage parking space. The unusual design is evocative of a “Manhattan loft” set in a historic 1869 carriage house. This surprise blending of original 1920 - 1940 art deco furnishings and many antique elements creates a fun, casual ambiance. The open and airy open concept living space showcases an entire wall of frosted artist windows, thus flooding the house with natural light. The bedroom with king bed and TV is adjacent to the alluring bathroom with luxurious features such as 6 foot air tub and separate marble shower. 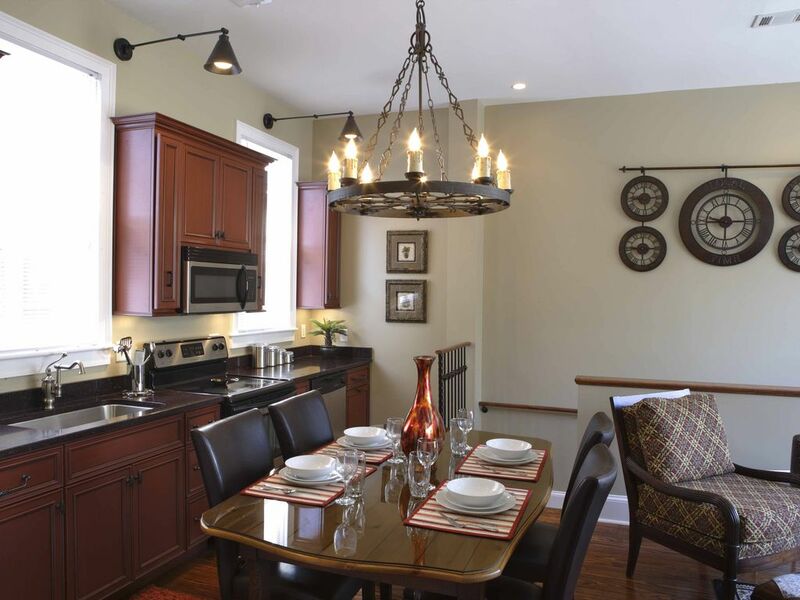 The designer red kitchen provides everything you need to whip up a Southern style feast or just grab toast and coffee on the way out your door to take in the cities historical sights that you are just steps out your door! Enjoy relaxing in the serene courtyard to the sounds of the fountain after a long day of sightseeing. Excellent carriage house, responsive management, fabulous location! We stayed three nights starting 3/27/18. This is a wonderful location! It's in the heart of the most lovely neighborhood of the historic district. An easy and scenic walk to Forsyth, Monterrey (and several other beautiful) squares). The garage was priceless because it's difficult to find road side parking nearby, and most of the time none of it is free! The carriage house was perfect. And, we must add, that management is friendly and responsive. We had a minor issue which was resolved promptly and in a highly professional manner. We will definitely stay there again! Our first visit to Savannah and thoroughly enjoyed ourselves! Carriage house was conveniently located and the garage was a nice bonus. Would recommend small vehicles only. Also, living room window let’s in light 24/7 which could be an issue for anyone sleeping in that area. Easy check in and checkout, no glitches. Cute courtyard area. Bathtub was amazing!! Would recommend to family and friends and would stay here again! Nice for couples!! Great location, garage parking helpful! Decorated nicely, bright living room area 24/7, be prepared if sleeping on sleep sofa. Relaxing bathtub!! Great for couples and romantic getaways!! We loved staying at the Wedding Cake Carriage House. The garage was perfect. We were able to explore other parts of Georgia and South Carolina, knowing we would be able to park our car safely when we returned to Savannah. We were close to a grocery store and Forsyth Park. The whole area around us was beautiful for walking. The interior of the carriage house was tastefully decorated and it was nice to have so much room for a vacation for two. I would definitely stay here again. I think it is a much better choice over a bed and breakfast or hotel. The carriage house is in a great location, within walking distance from the squares, restaurants and bars. Everything was clean and comfortable. We had a great time. Stayed at the Wedding Cake Carriage House for the Best **** Race 1/2 Marathon and this was the Best **** Rental. Perfect location and very clean. We really enjoyed our stay and when we make it back to Savannah we will definitely try and rent here. 10% OFF 5 night stays! Mid Week Specials!! 20% Off on Reservations Starting on Monday Ending on Thursday!